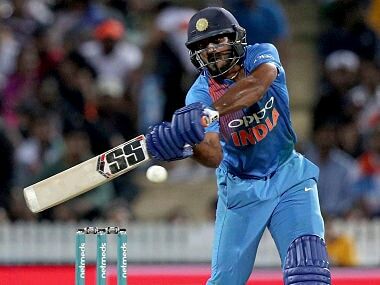 London: A supremely assertive India on Tuesday humiliated Bangladesh by 240 runs in a warm-up game and geared up for the ICC Champions Trophy in an emphatic fashion, sounding a warning for arch-rivals Pakistan. Playing in their second warm-up match, the defending champions made short work of their sub-continental neighbour bowling them out for 84 in 23.5 overs at the Oval after piling up a commanding 324/7. An all-win record in warm-up games is the ideal preparation ahead of the marquee clash on 4 June. 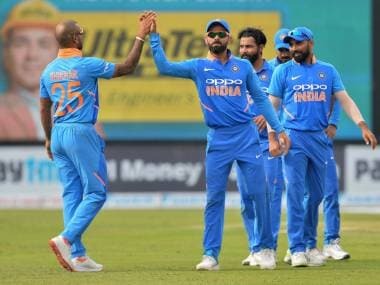 It was an all-round performance with some solid batting backed up by a hostile opening spell from Umesh Yadav (3/16 in five overs) and Bhuvneshwar Kumar (3/13 in five overs). Among batsmen, Dinesh Karthik made a strong case for a middle-order slot with a stylish 94 off 77 balls. Shikhar Dhawan (60) got runs under his belt against a quality Bangladesh attack comprising Mustafizur Rahaman (1/53), Rubel Hossain (3/50) and Taskin Ahmed (0/45). Hardik Pandya showed his utility as an all-rounder with an equally impactful unbeaten 80 off 54 balls, which was laced with six boundaries and four huge sixes in the arc between mid-wicket and long-on. When their turn to bat came, Bangladesh surrendered meekly in the face of some outstanding bowling by the Indian pacers. The pace duo of Umesh and Bhuvneshwar posed tough questions with some relentless bowling, sticking to the line outside the off-stump. Yadav, who can also hit the deck hard, bowled a lethal first spell, tormenting the clueless Bangladeshi batsmen. 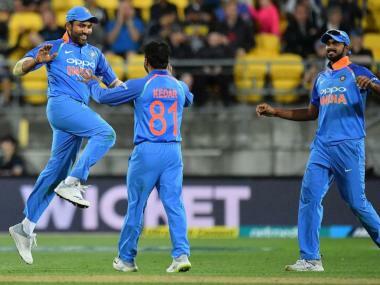 While India put themselves in a strong position by notching up 324, the match was as good as over when the 'Men in Blue' reduced Bangladesh to 22/6 in only the eighth over of the innings. Yadav provided the first breakthrough when he had Soumya Sarkar, slashing away from the body, caught behind with one that swung away. Three balls later, Bangladesh were 11/2 as Yadav went through the meek defence of Sabbir Rahman. And they lost their third wicket too, without disturbing the scoreboard, when Imrul Kayes' mistimed pull off a Bhuvneshwar short delivery was taken by Yadav at mid-on. Bangladesh went from bad to worse when Bhuvneshwar bounced out Shakib. The Uttar Pradesh pacer then induced an edge from Mahmudullah to leave his team reeling at 21/5 in the seventh over, with Karthik completing a good one-handed catch on that occasion. Things deteriorated further as Yadav came back to send back Mosaddek Hossain with a terrific outswinging delivery. A brief partnership ensued, but that could only help in delaying the inevitable. Earlier, courtesy of Hardik's big hits towards the end, India crossed 300-run mark. 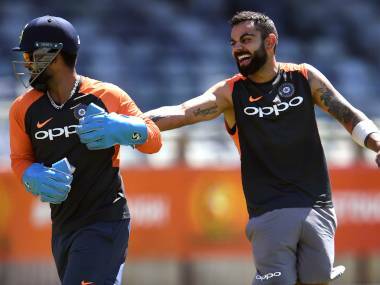 Skipper Virat Kohli and former captain Mahendra Singh Dhoni did not bat, giving others an opportunity to get a good hit before the big-ticket Pakistan game. With Yuvraj Singh not coming out to bat, indicating that he is yet to get fit, Karthik, after his failure against New Zealand, grabbed the second opportunity. He hit eight boundaries and a six and, in the process, also sent feelers to the team management that he is also a candidate for a middle-order slot. He added 100 runs with Dhawan for the third wicket after Rohit Sharma (1) and Ajinkya Rahane's (11) lack of footwork saw them getting played on. Rohit was dismissed by Rubel while Mustafizur got the better of Rahane. But Karthik showed composure during his innings under mostly overcast conditions. His first boundary was a cut shot off Taskin followed by a superb straight drive off Mustafizur. He was severe on off-spinner Mossadek Hossain and left- arm spinner Sunzamul Islam, cutting and pulling anything that was short. Sunzamul was pulled for a four and a six in one of the overs and he also ran the singles well. Dhawan hit seven fours — mostly through off and cover — and was more patient than Karthik, waiting for the loose balls. He faced 67 balls before holing out at mid-wicket off Sunzamul, who went for 74 in his nine overs. Kedar Jadhav (31) also got some batting time while Ravindra Jadeja (32) chipped in with useful contribution.